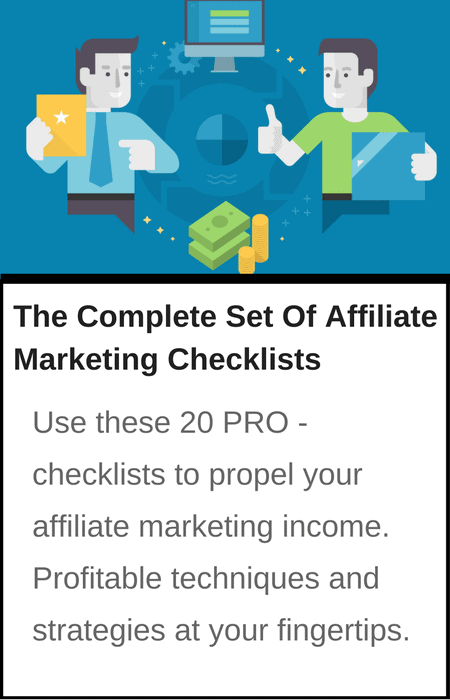 From Overwhelmed To Overjoyed: Here Are The 20 Critical Checklists You Need To Make Affiliate Marketing Faster, Easier And More Profitable Than Ever Before! Now you too can avoid the most common affiliate mistakes, take all the pro shortcuts, and grow your affiliate business simply by following a set of proven and easy steps! Ever get that nagging feeling like you’re totally missing something? It happens when you’re packing for vacation. It happens when you’re shopping at the grocery store. And if you’re like most business owners, it happens a LOT when you’re setting up your affiliate marketing business. It feels like there are just an incredible number of steps you need to take. It’s overwhelming. You get the feeling you’re missing something, but you don’t know what it is. Sometimes you KNOW you’re missing something, because you’re not getting the results you want. Your Complete Set Of 20 Affiliate Marketing Checklists For Picking The Right Product, Driving Traffic, Building A List And Generating Huge Commission Checks! You’ll go from being overwhelmed to overjoyed once you see what these 20 checklists can do for you. I’ve taken an entire multi-volume encyclopedia set of affiliate marketing information and digested it down to the bare minimum of what you need to know to get great results. sort of mini-blueprints for my own affiliate marketing campaigns! created and assembled in this amazing package! The checklists (AKA “mini-blueprints”) are more than just a set of steps arranged chronologically into a bulleted list. There is actually some meat to these checklists that I know you are going to find helpful. And that’s just ONE of TWENTY checklists that you’ll get when you download this package today! of “no fluff” profitable affiliate marketing strategy and content in Endless Affiliate Profits! Whether you’ve decided to use affiliate marketing as your main business model or you’re looking to promote affiliate offers alongside your own offers, the key to success is to get everything set up the right way. So slash the learning curve and avoid costly mistakes by using this ultimate affiliate marketing checklist! I’m going to say something that might surprise you. If you can make $1000 in affiliate commissions, then you have the tools and know-how needed to make $100,000. So what do you need to do to make that first $1000? This checklist will show you the way! One of the biggest affiliate marketing mistakes is to send traffic directly to a vendor page, which often results in wasting up to 99% of your traffic. Instead, what you need to do is get people on your list, build relationships, and close the sale via follow up emails. This checklist shows you exactly how to do it! Sure, winning an affiliate contest is fun, and it puts a lot of money and some cool prizes in your pocket. But the other thing it does is raise your standing in the niche. Next thing you know, all the vendors are beating a path to your door to beg you to promote their products. 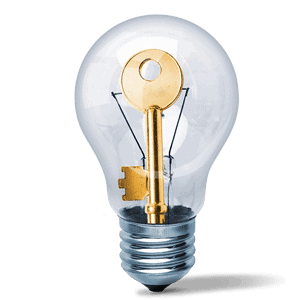 They’ll even dangle some really cool perks in front of you, such as super affiliate commissions and bonuses. Point is, winning affiliate contests can open a lot of doors for you. And this checklist will show you how to do it! The beauty of setting up a blog is that it gives you a great chance to build relationships with your audience, especially with those people who haven’t yet joined your mailing list. But it also gives you an opportunity to promote your affiliate offers in a variety of ways. Take a look at this checklist to discover how to maximize your affiliate sales using your blog! Posting articles on your blog that either soft sell or directly sell products is a good strategy for increasing sales. But a lot of marketers overlook the many ways you can boost sales by inserting features that sell even more affiliate products. How do you design your blog to maximize sales? Download this checklist to find out how! You’re promoting the highest-converting, most in-demand affiliate offers on the planet. You’ve got some great ads. But if you don’t have targeted traffic, then you’re going to be hurting for sales. And that’s why you’ll want to take a good look at this checklist, which will show you three great ways to start bringing in lots of traffic! There are plenty of ways to promote your affiliate links, including via blog posts, webinars, reviews, videos, through emails and on social media. But no matter which method you select, there are proven preselling tactics you can use to boost your conversions. This checklist reveals these surefire tactics to you! One really good way to start pocketing commissions is adding value to the vendor’s offer. In other words, give away an exclusive bonus for those who buy an offer through your affiliate link. But here’s the catch: just going through the motions of adding a bonus to the offer isn’t going to boost your commissions. You need to create something that’s going to get people clicking on your affiliate link. And this checklist shows you how to create the perfect bonus that generates more sales! Whether you’re brand new to a niche or an established affiliate marketer, partnering up with other like-minded marketers is a great way to get traffic, generate fresh leads, create content fast and produce sales. Best of all, not only is partner traffic highly effective, it’s also completely free. Take a look at this checklist to find out for yourself some of the best ways to leverage other peoples’ assets! Here’s the question that’s on every affiliate’s mind: how do I increase my commissions? Increasing your traffic and growing your mailing list and platforms are two ideas that spring immediately to mind. But that’s just the tip of the iceberg when it comes to making more money with your affiliate business. Inside this checklist you’ll discover seven other proven and often surprising ways to boost your commission checks! Your prospects aren’t “one size fits all.” So if you send out a preselling email that appeals to one type of prospects, that email is going to fall flat with the other prospects. So here’s the solution: send out a series of three emails with a different appeal in each email. Specifically, send out a Fear, Logic, Gain sequence. And you can create this sequence in just minutes using these three email templates! Live events tend to carry a high perceived value, which is why webinars are so popular right now. And because you can gauge the audience’s reaction and take questions, a webinar also makes a great platform to presell affiliate products. Best of all, you can offer the webinar replays or recordings to future prospects, so you can keep generating sales for weeks or months to come. Ready to tap into this powerful strategy for yourself? Then download this checklist now to get started! When some affiliates think about a sales funnel, they assume it is something that only vendors need to worry about. And you know what? That’s a big mistake. Because if you want to make a lot of money as an affiliate, then you need to create your own sales funnels. How? By using this checklist as your guide to setting up you own profitable sales funnel! There is one thing that almost all successful affiliate marketers have in common: they use tools to make daily tasks in their business easier, faster and better. 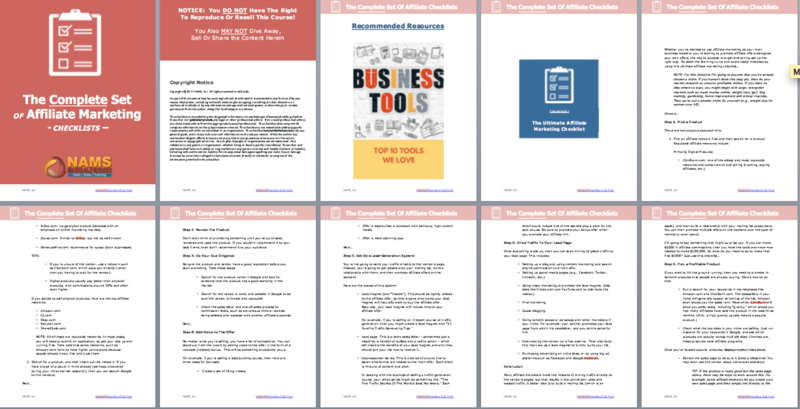 And if you want to up your game and take your business to the next level, you’re going to want to get your hands on these tools too. This checklist covers the essentials! One of the benefits that brick and mortar retailers have is that customers can come into the store and hold the product in their hands. When someone holds a product, they start imagining what it would be like to own the product. And when they imagine owning the product, it’s just a short leap to buying it. That’s why car dealers are so eager to get prospects in for a test drive. Of course you don’t have that luxury online… or do you? Truth is, a well-crafted demo/review video can serve as a virtual “test drive” of the product you’re promoting, which in turn boosts conversions and generates a whole lot of sales. And this checklist shows you how do to it! As an affiliate, copywriting is hands-down one of the most profitable skills you can develop. That’s because learning the art and science of writing effective copy is a sure way to boost your conversion rates, which means you’ll get more clicks, more traffic, more subscribers and more sales. Start with this checklist! Are you making any of the common affiliate marketing mistakes that could be killing your conversions, your commissions and your business? Find out by using this affiliate makeover checklist, plus get the quick ways to fix these problems! Making money as an affiliate doesn’t mean you need to be directly and personally engaging your prospects every minute of the day. In fact, one of the beauties of a well-run affiliate business is that you can make money passively. Nothing is better than getting up in the morning to see your PayPal account has received new commissions overnight. And this checklist shows you some of the best ways to earn this passive income! The struggling affiliate who can’t seem to bring in any consistent cash. The so-so affiliate who makes a few hundred dollars per month, but wants more. The super affiliate, who pulls down a nice commission check every month like clockwork. If you’re either a struggling affiliate or a so-so affiliate, then you’re going to want to use this checklist to take you to super affiliate status! 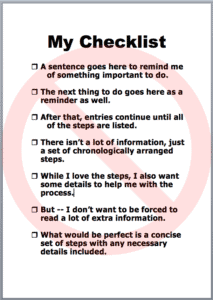 You’re Going to Say “WOW!” When You Use These Checklists! Avoid all the affiliate marketing pitfalls and mistakes that plague most online marketers! Maximize your profits by getting prospects on your mailing list and preselling them to boost conversions! Make affiliate marketing faster, easier and more effective than ever before! Now you have one question, right? Good news – this is the most affordable set of tools you’ve ever seen. Because when you order now, you get these checklists for just $2.35 each – that’s a total of $47 for the entire collection. Plus once these strategies produce just one or two affiliate sales for you, you’ll have recouped your entire investment. You can do that incredibly fast, which makes this offer a great deal! Act now and you can take advantage of the special introductory sale pricing of just $17 for everything you see on this page! That’s right, with your savings you pay just $.85 per checklist! But hurry, this special offer won’t last long, so click the buy button below now to get started! Have you ever wondered what the super affiliates do that you don’t do? You’ll find out inside these checklists! Now you too can put the most profitable affiliate marketing strategies to work for you starting today! You've made a great decision! Now, it's time for us to live up to our end of the bargain. And we always do, no matter what the issue is. Our reputation is the most important thing we have at NAMS. We've helped hundreds of students create new businesses or improve existing ones. Still, we want to make this even easier for you! Our fool-proof guarantee says that you will have 30 days to decide whether this is for you. And frankly, it's not right for everyone. Only those who are serious about taking control of their lives and their businesses need apply! But if that's you, jump and we'll assume all the risk. If you change your mind for any reason within 30 days of purchase, we'll happily refund your money. You have nothing to lose! There's no risk to you. Try it and love it. If not, you can get your money back easily, quickly and safely with our fool-proof guarantee! SAVE AN EXTRA $30 NOW!